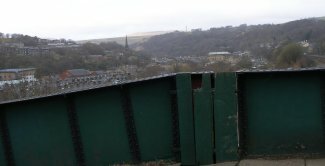 The reason there's been little process with the model is because I've been to Todmorden, and here's a selection of shots of those irritating details that generally one ends up guessing - in my case - wrongly. 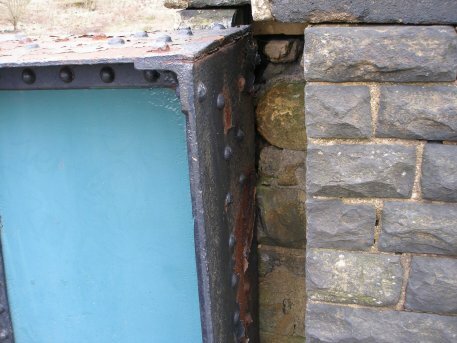 The two sets of girders rest on a stone pillar, and on the western side three old planks stop people posting their arms through the gap, whilst in the eastern side the girders are much closer together, so no plank, although the angle iron suggests that there was a plank here previously. Also a couple of snaps taken looking over the parapets - what a wonderful collection of old cable reels! Finally some detailed shots of the pillar and southern retaining wall, and a sign that sets the scene. Since the last update, a number of issues emerged. I didn't assemble the Wills Vari-girders with sufficient care, so there were gaps and mis-alignments which I knew about, even if they were lost in the bigger scheme. Worse, the Humbrol #1 Grey Primer I used dried with a satin sheen, which still 'shone' through the weathering even when the maskol was picked off. 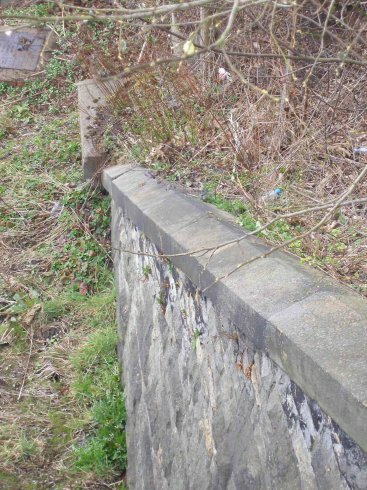 The top-end abutment was also too high: despite scaling off the gradient from a photo provided by the L&YR Society. 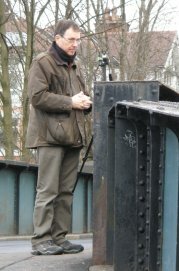 I proved this by comparing a snap of the prototype with train passing under the bridge with one of the model superimposed. This was involved hacking the over-matter from the bottom of the abutment using the trusty Dremel. In some respects the 'rust showing through' technique worked, but I couldn't brush the maskol on in small enough streaks to create the effect needed for the bridge in the early 60s. Deep breath time. I ordered more Vari-girders and started again.This time I used car spray grey primer which has given a much better result. The next task was therefore the road surface. To form a tarmac road surface David Jenkinson wrote of a technique of brushing sticky gloss black onto the road and then covering with fine granite ballast. I tried this, and its not bad, but the gravel size was still too large despite using the finest of fine ballast. I had some fine silver sand left by the builder who did our drive, so adopted a technique of gloss black > fine sand > surplus brushed off > light spray with car spray grey primer. This is what you see in the photo. From a study of real roads and pavements, I have concluded that the roads look more grey as the car tyres rub the tarmac coating off the grey gravel, whilst the equivalent tarmaced footpath is more black and less grey, with only feet passing over it. In all of this, I have assumed that there was a paved area on the bridge from erection, as of now, but I have been unable to locate any photos of road element of the bridge pre-Google Streetview. The next phase will see the kerb stones laid on both sides of the roadway, and then the footpath laid, but this time just using sand on the glossy black, possibly lightly listed with 'sooty black' or equivalent. More next week. 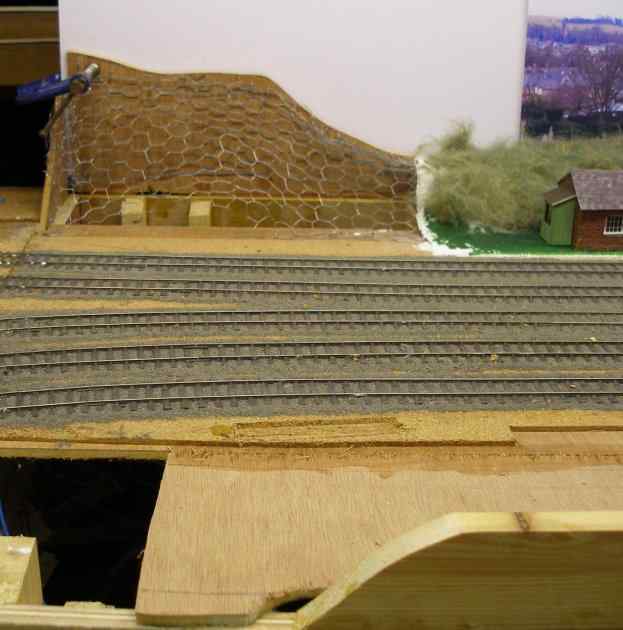 The site survey of the model in February 2013 shows the chicken-wire in place, and the baseboards and track ready for the bridge. 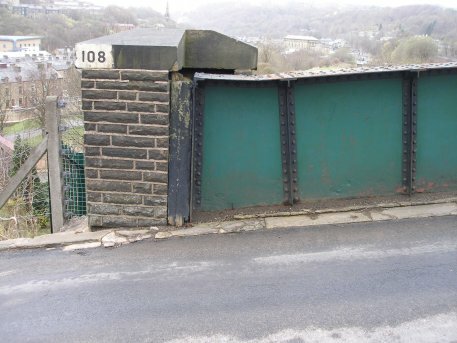 The design of Hall Royd Road bridge has some technical interest. 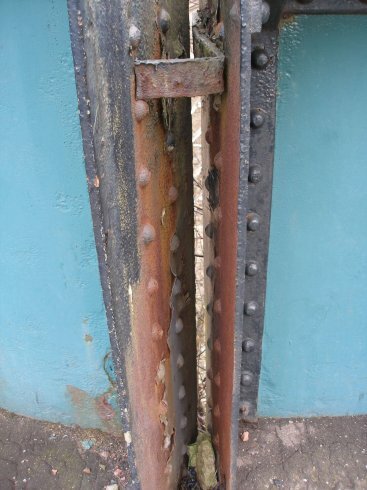 First, there is a short span which springs off at an angle, and rests on a stone pier, bridging the space where the up Manchester loop might have terminated closer the signal box. The second span is at right angles to the track below and clears all five tracks without an intermediate span. It is also quite narrow, and today there is also a footpath on the eastern side of the roadway, and traffic lights to control a single carriageway. It is from this footpath that many of the photographs of Hall Royd are taken. 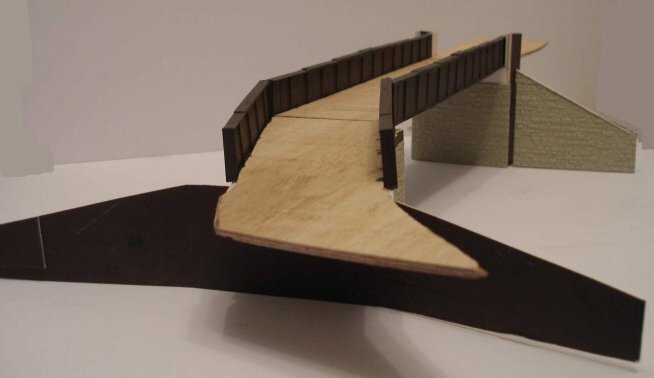 The model has a 3mm plywood roadbed, and ply centre pier, but laminated card abutments, clad in Wills Random Stone. The girders are also Wills - these are slightly too wide for Hall Royd, so we are a couple of panels short. The western girder is half a panel longer than its eastern companion, but the Wills panels feature the end panels, and so it's an easy task to cut one of these in half. Bostick clear has been used to glue the stonework sheets on, but care is needed with large sheets of the thinner Slaters brickwork as I have found that Bostick tends to distort the plasticard over time. In that respect the non-solvent version is better, but doesn't 'grab', so the workpiece needs to be put to one side until the glue has dried. 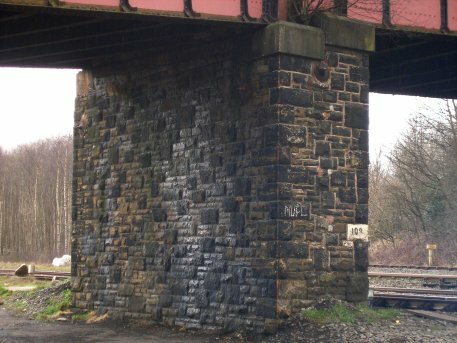 The lower part of the abutments are in stone, but the upper parts that protect the ends of the girders and bridge bearings are in brick. I assume this is original, and not the result of a rebuild at some time following an accident. In these shots of 'work in progress' the bridge girders have been painted in Humbrol chocolate (98) to represent dark rust. The plan is to streak or dab the structure with Maskol before top-coating with Humbrol Grey Primer (1). The Maskol will then be picked-off to make it look at if the rust is breaking through from beneath. 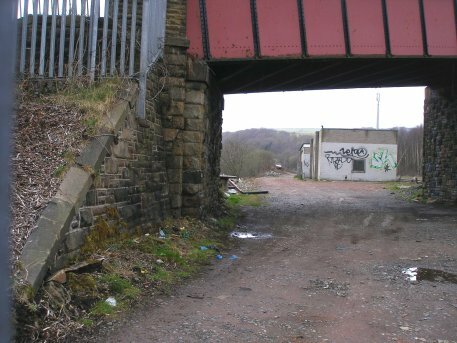 Hall Royd Road bridge lies at the western end of the layout, directly over the point where the line to Copy Pit and Burnley swings off to the north. 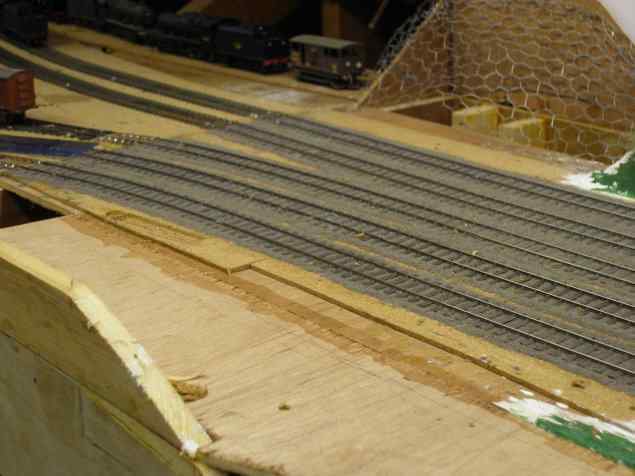 In the original layout here the physical junction was actually where the bridge is now, the road crossing on the level. The site of the crossing is probably where the Permanent Way hut was latterly located. 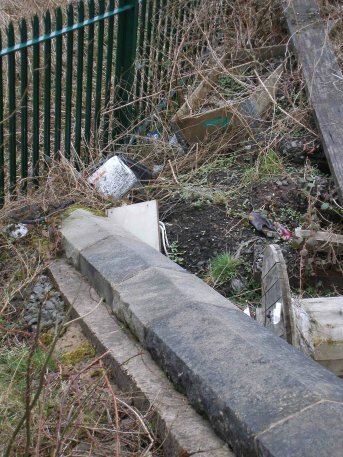 There is a photograph on Roger Birch's Todmorden Album site of the level crossing and junction. 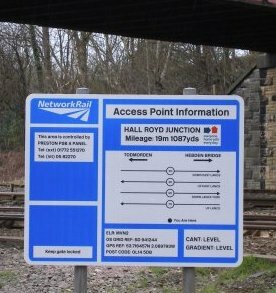 When you go through to the site, use the navigation on the left, thus Themes > Rail > Other > Hallroyd Crossing. Roger notes that the photo was taken in the 1890s, and the level crossing was removed for safety reasons in 1896 and replaced with a road bridge some 75 yards west of the old crossing. 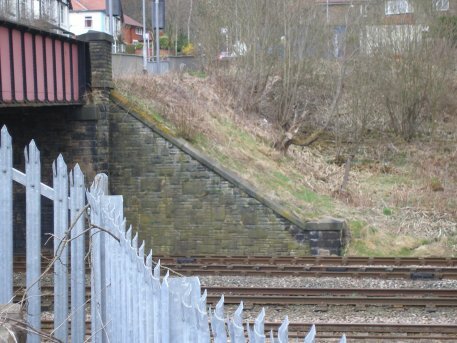 One suspects that safety would have been a lesser factor given that the L&YR wanted to fit a goods loop in here to increase capacity on the Calder Valley main line going eastwards, and having a level crossing over five tracks, one of which would have looped trains standing on it whilst other, faster services overtook it and/or locomotives took water would have made using the crossing for both the railway and public a nightmare. In September 1899 the Board was told about a project involving the outlay of a couple of million pounds consists chiefly of doubling the L&YR main lines between Normanton and Todmorden, a distance of about thirty miles […]. One thing the Company desire to do, and that is to accelerate their present passenger train service, which can easily be accomplished when four “roads” – two “up” and two “down” – are laid. Already there are four sets of metals in certain parts of the distance but the intention of the Company is to duplicate the existing line […]. The land necessary for this purpose seems to have been acquired or is in the process of being negotiated for. Indeed a start has already been made with the work outside Normanton station. Messrs T Young & Co. contractors, Wakefield, have just commenced the task of widening the present line on both sides from Goose Hill Junction to a point three quarters of a mile nearer Wakefield […]. Other work will mean the partial reconstruction of some stations and the complete demolition and re-erection of others. This will be good news for the residents of Horbury who have long complained of the character of the accommodation provided for them.